What we know about Socrates comes mostly from his student, Plato. Plato called Socrates “the best of all men I have ever known.” Plato wrote down his teacher’s ideas in a series of dialogues. A dialogue is a conversation between two people. Plato was a young man when he began to study with Socrates. Plato came from a very wealthy and powerful family. He was named Aristocles, but he was better known as Plato, a nickname that means “broad." Plato’s nickname could have referred either to the philosopher’s broad shoulders or to the breadth of his great intellect. When Socrates died in 399BCE, Plato left Athens for more than a decade. He returned to start the Academy, a school where Plato and his invited guests would discuss philosophy. Plato saw his imperfect world and thought of ways he could improve society. Plato wrote about utopia. A utopia is an imaginary place where governments and social conditions are perfect. No government has ever adopted Plato’s ideas, but his philosophy influenced leaders for over two thousand years. Plato argued in favor of an “aristocracy of merit,” or rule by the best and the wisest people. 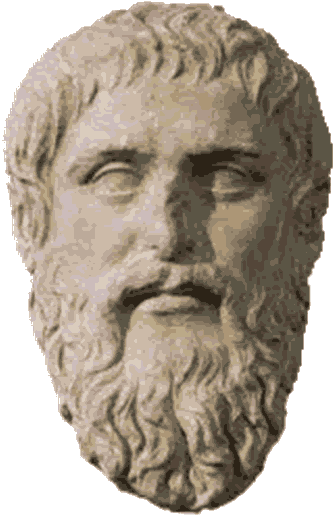 Plato believed that the government should raise all children so that everyone would have equal opportunities. Schools would test students on a regular basis. Students who did poorly would be sent to work, while those who did well would continue their studies. Plato believed a small group of intelligent and educated men and women should govern society. This small group would select the best and the brightest students to join them. Later in his life, Plato mentored a young man named Aristotle. A mentor is someone who teaches or gives help and advice to a less experienced and often younger person. Aristotle’s ideas would form the basis of modern science. Along with his mentor, Socrates, and his student, Aristotle, Plato helped to lay the foundations of Western philosophy and science. 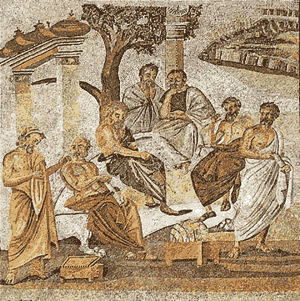 Plato and his invited guests would discuss philosophy at the Academy. Plato and Aristotle are the central figures in Raphael’s sixteenth-century fresco, The School of Athens. 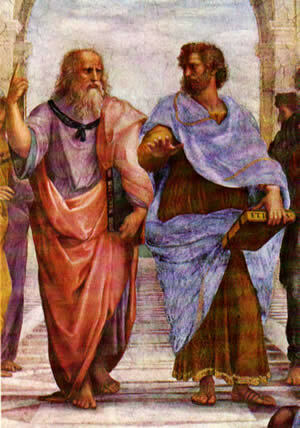 Plato (left) points to the heavens while Aristotle (right) points outward suggesting his belief that natural forces can be explained by logic and reason.